One hundred percent of the wool in this wrap was created from fleece from my own flock; Merino wool warp & Romney wool weft. 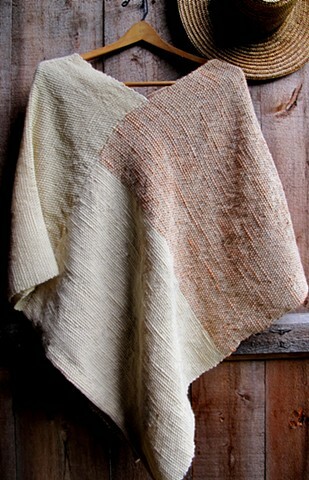 The Romney fleece was hand-spun then hand dyed in a natural dye vat made of madder root (Rubia tinctoria) for an earthy rose-orange color. This is an extra-large wrap (36" x 38"), so would look best on a tall woman.